This month is going to include lots and lots of chocolate. I’m sure you’re terribly upset with me about that. Well, actually, if you are on a diet, you might be. So my apologies in advance. Foodie Extravaganza is a monthly food fest, where a group of bloggers all create and share a recipe around one of the monthly food ‘holidays’ as detailed in The Nibble. This month Kathleen from Fearlessly Creative Mammas is hosting and since chocolate day is October 28th, Chocolate is our theme. There are actually two other days that incorporate chocolate in October, the 14th is Chocolate Covered Insect Day and the 18th is Chocolate Cupcake day. We could do just about anything for this month; cook with chocolate, bake with chocolate…even make chocolate! I have tons and tons of chocolate recipes saved. 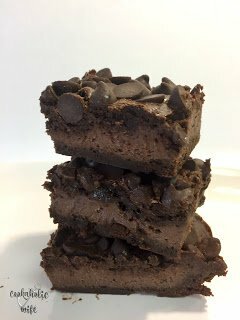 My husband loves chocolate and always wants me to make a new chocolate recipe he can try out. Since I am eating healthier, I thought about selecting a recipe that allowed for the skinnier side of chocolate and then I quickly decided that if this entire month is all about chocolate, I was going to start it off right with some serious decadence. There are two types of brownie people in this world. Those who like cakey brownies and those who like fudgy brownies. If I wanted a cake, I’d eat a cake and not a brownie, so I firmly fall in the fudgy brownie camp. If you’re like me, you’re absolutely going to love these brownies. If you’re a cake brownie lover, you’re still absolutely going to love this brownies. 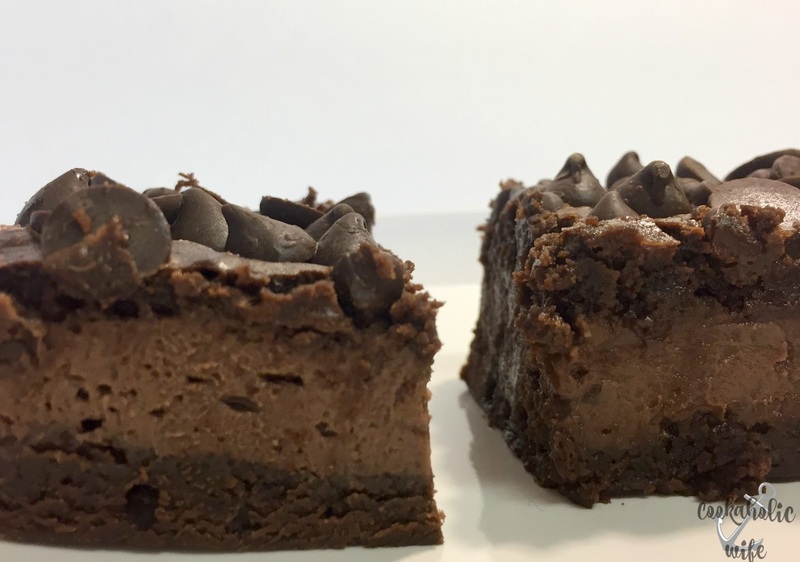 The most decadent brownies you’ll ever have, these hot fudge cheesecake brownies are worth every minute it takes to prepare them. 1. Preheat your oven to 350. Line a 9×13 baking dish with foil and spray with non-stick cooking spray. 2. Measure the flour and set aside. 3. Combine the butter and chocolate chips in a bowl. Microwave in 30 second intervals, stirring after each until melted fully together. 4. Whisk in the cocoa powder followed by the brown sugar. Then add the eggs, one at a time, followed by the vanilla and salt. 5. Slowly whisk in the flour until no lumps remain. Pour half of the batter into the prepared baking dish. 6. Remove the lid from the hot fudge sauce and microwave in 20 second intervals until it is hot enough to pour. 7. Place the softened cream cheese in the bowl of your stand mixer and pour the hot fudge sauce on top. Beat on medium speed until smooth and no lumps remain. 8. Carefully pour the cream cheese mixture on top of the brownie mixture. Gently spread the top with a spatula but don’t mix the layers. 9. Pour the rest of the brownie batter on top of the cream cheese mixture and gently spread on the top layer to cover the cream cheese but not mix the layers. Sprinkle the chocolate chips on top. 10. Bake for 35-40 minutes then allow to cool on the counter for 2 hours before refrigerating for at least 4 hours but preferably overnight. 11. Cut the brownies into squares and serve. This recipe requires at least 2 hours of refrigeration. The first time I made these brownies I took them into work and the managed to disappear entirely in two hours. Everyone was coming up and telling me how delicious they were and how they wished I had made another pan. The second time I made them was for a small get together I was having at home and I got the same result, that these brownies are absolutely incredible. I’m fairly certain if you were to google the definition of chocolate decadence an image of these brownies would appear. If you are a blogger and would like to join our group and blog along with us, come join our Facebook page Foodie Extravaganza. We would love to have you! If you’re a spectator looking for delicious tid-bits check out our Foodie Extravaganza Pinterest Board! Looking for our previous parties? Check them out HERE. Now, check out these great chocolate submissions! I think I have died and gone to heaven with this recipe!! So rich and creamy! My husband would love this so I'm definitely going to try it!! Wowza. Yep, you had me at 'hot fudge.' I can't wait to try these. They sound really, really great. I love hot fudge, so I'm sure I would love these babies. Oh wow! These brownies look absolutely incredible! I love that cheesecake layer. Fudgy brownies all the way! Holy Samoly those are some decadent sounding brownies. Holy moly, these look rich and would satisty ANY sweet tooth!